St Peter sits hard against the busy Swaffham to Cromer road, a landmark site for a thousand years or more. It marks the northern end of Weasenham, a large, straggling village divided into two parishes, and there is another medieval church at the southern end of the village in a slightly more secluded setting. In days gone by, Weasenham St Peter was known as Lower Weasenham. 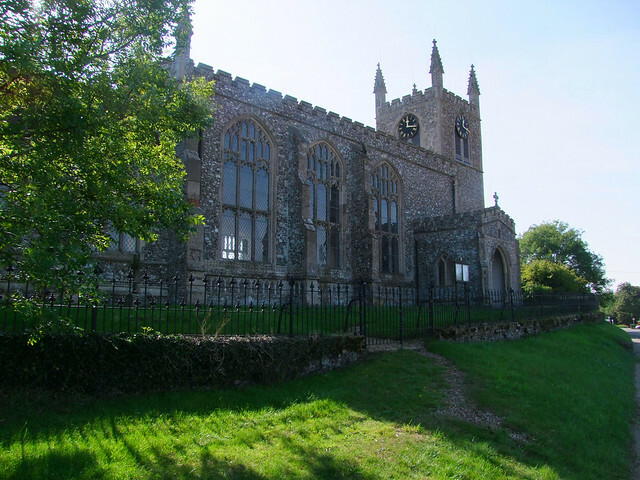 Both Weasenham churches were considerably rebuilt. All Saints, at the other end of the village, was reconstructed in 1905, but St Peter underwent the privilege thirty years earlier. There is a photograph of the church on display inside which shows it on the eve of its restoration, and in all honesty it is hard to see much externally which survived from that time. Even the flushwork was reset and made crisp. The path to the church climbs steeply from the busy road. For many years, this church was kept locked against visitors, but today it is open every day, and you let yourself in through the north porch into a warm, moderised interior. Just as Weasenham All Saints up the road was rebuilt for Low Church congregational worship, so this place celebrated the Anglo-catholic tradition, and to an extent continues to do so. And, just as the other church has one great medieval survival in the form of its rood screen, so St Peter has its own survivals in the form of 15th Century glass. 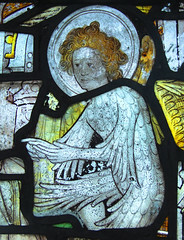 There is a beautiful figure of St Margaret dispatching her dragon, and in the next window a Norwich school angel. They were both originally set in upper window lights, and are now surrounded by fragments of contemporary tabernacle work. There is no way of knowing, of course, if they came from this church originally. 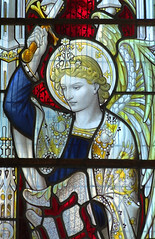 Turning to the east, you meet the delight of a splendid window by William Warrington. It commemorates someone who died in 1849, but can it really be that early? It is full of exuberant colour and details, and if the date is right then it preempts much of the enthusiasms of the mid-century Ecclesiological Movement. The central subject is a crucifixion, the Blessed Virgin, Mary Salome and St John looking on grief-stricken and Mary Magdalene burying her face in her hands. The same figure of Mary Magdalene appears to the left, an unusual scene of her pouring oil onto Christ's feet while a po-faced Judas looks on. On the right, rather more awkwardly, Christ welcomes the children. Above, St Peter and St Paul in sentry box-like tabernacles look up to the Blessed Virgin and Child. 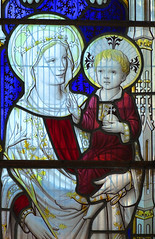 it is remarkably early work for such Anglo-catholic themes in early Norfolk. 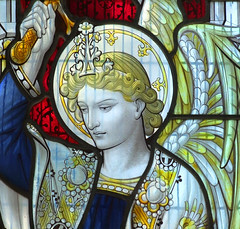 Above, there are angels and a shield of the Holy Trinity. I think this window is really rather wonderful, and appears little-known. Any doubts as to the Anglo-catholic sympathies here in the mid-20th Century may be allayed by stepping through the curtain that divides the south aisle from the nave. 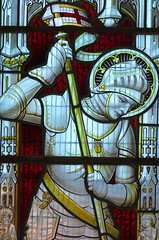 Here, the east window is another splendid creation, this time by Christopher Webb I think, depicting St George and St Michael flanking the Blessed Virgin and Child. Below is a deliciously carved and painted altar with figures representing the Annunciation, the Crucifixion and the Resurrection. Could it have been carved locally? I was so pleased I'd seen inside and it was so lovely. For years, the Weasenham churches were a little black spot in this area of Norfolk where pretty much all the churches are open and welcoming, and being so close to the main road it would be nice to think that they will be able to attract visitors in the way that Newton by Castle Acre does on the same road a few miles to the south. This church, full of light and colour, is a complete contrast with its neighbour up the road, but both are fine buildings, and both welcoming. St Peter has the edge in survivals, because it also retains its original font, which I think is late 14th Century, its bowls decorated with quatrefoils. Someone has later carved 1607 into the south face, too neatly to be vandalism, I think. Could it mark the date the font was brought here from somewhere else? Bill Wilson in the revised Pevsner notes that the church was criticised for being excedinglie decaied by the Necligence of the Propietaine in 1602, so perhaps there was a considerable restoration at that time. An intriguing thought, because this would be too early for Laudian sacramentalism to have any influence. I wandered around to the south side of the church, where the graveyard is wide and open. Here is an excellent collection of high quality headstones of the late 18th and 19th Centuries, the funerary symbolism including weeping willows, draped urns, figures of grief, coronets, rayed books, cherubs, and the stark reminder that the Mortal must put on Immortality. Many are to members of the Billing family, who were obviously a prosperous lot. And yet, by the time of White's Directory of Norfolk in 1845, they had all gone, and indeed it is striking that both Weasenham churches are relatively bereft of memorials. 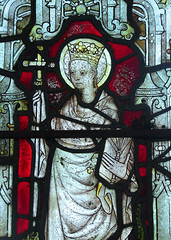 White does record the intriguing detail, however, that in the reign of Edward III, Sir John de Wesenham of this parish was the king's butler. Being a rich merchant in the City of London, he had the king's crown in pawn for money advanced for the wars in France.